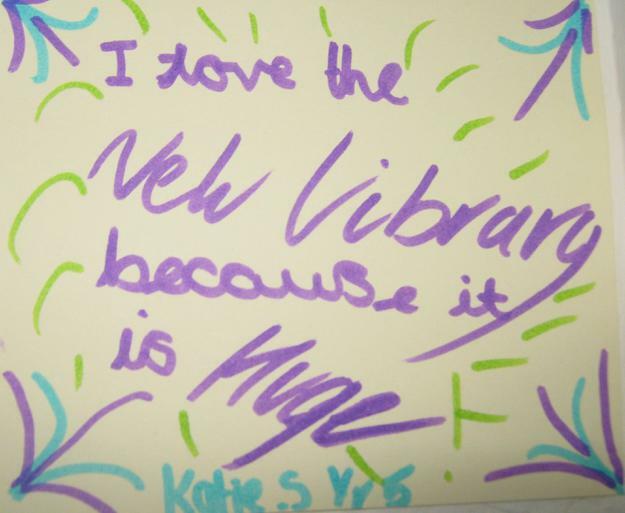 the Library is open and books can be borrowed again. If the computer in the Library is not on, or is not working and you would like to borrow a book, please leave a note of the bar code inside the book and your own PIN number, which can be found inside the 'Library codes folder'. If you have any queries, I will be in the school Library every Wednesday and Thursday. 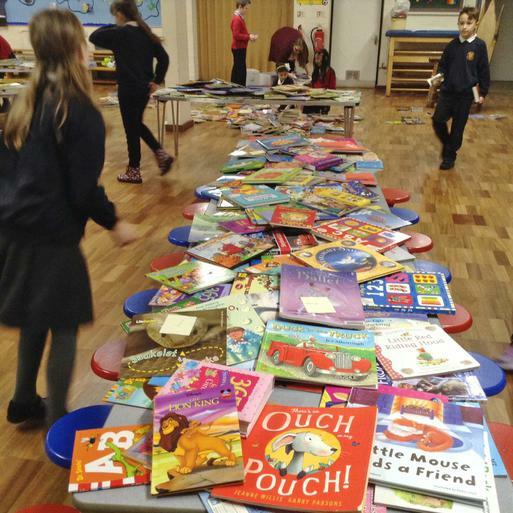 Hello, in order for the annual stock check to be completed, could all library books be returned to School as soon as possible please! No more library books will be able to be borrowed for the rest of the term. There are donated books in the School foyer, if you would like something to read over the summer. Welcome back after the Easter break, I hope you had a lovely time! 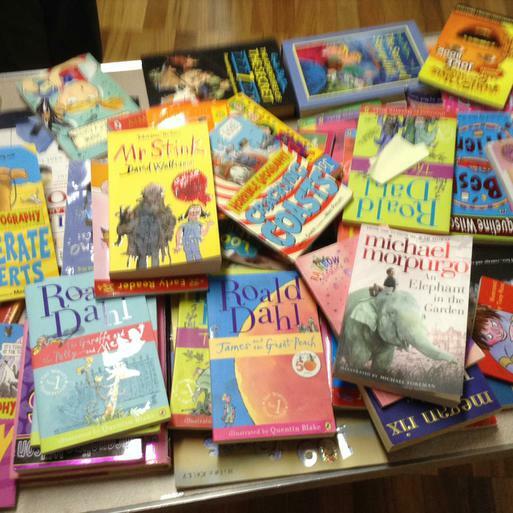 The library has received kind donations of lots of wonderful pre-loved books, which are now ready to borrow. 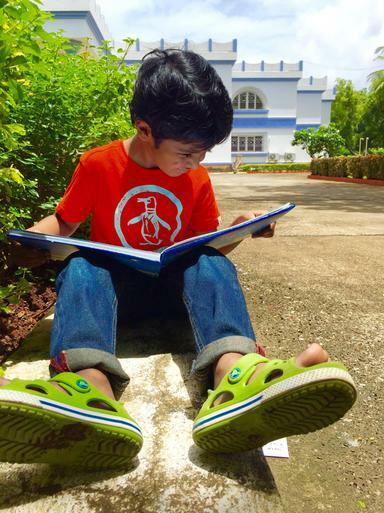 There are non-fiction and fiction books for all ages. The books can be found on the 'new books' shelf. Come and have a browse in the library and see what you would like to read next! 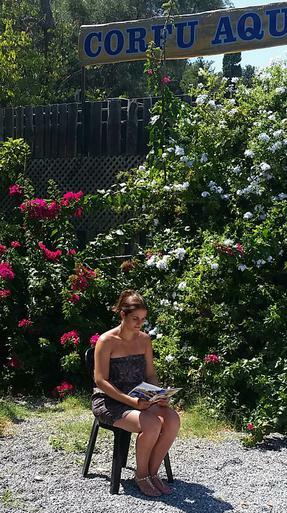 I hope to see you soon...keep reading! my name is Mrs.Archer and I am the School Librarian. 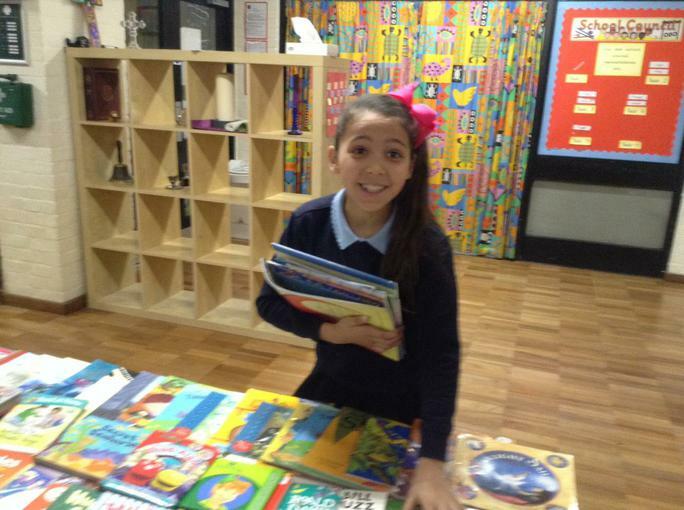 I will be working in the School Library every Wednesday and Thursday: 9.00am- 3.30pm. If you would like help with choosing or reserving a book, please do not hesitate to ask me. If I am not in School, please leave a note with your query on my desk. New Library Monitors coming soon. This is the link for the library net for children at home. The Summer Reading Challenge starts TODAY!!! Get yourself down to your local library to sign up! The Library Monitors will all receive a certificate of thanks during Celebration Assembly . They have made an outstanding contribution to the library this year, from helping keep it tidy, providing ideas, promoting the library and events, as well as the stunning performances in the three assemblies. New library monitors will be chosen early in the Autumn term. During the assembly there will also be an official handover of the wonderful artwork that was commissioned as a centre-piece of our amazing new space last year. New pictures have been completed and will be unveiled at the start of term. All library books are overdue. 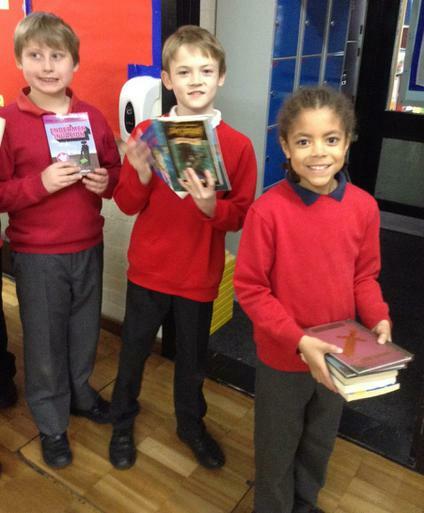 Please can you ensure all library books are returned. This year's Summer Reading Challenge is starting from 17th July 2017. The children will be receiving a short presentation and will be bringing a flyer within the next few days with all the details. We would love to see lots of children take this challenge and bring their medals in to the Academy at the start of term. The Library is now closed for new loans. All library books are due back by Monday 3rd July AT THE VERY LATEST. This is to stock check and prepare for the new academic year. There will shortly be an end of year recall of all library books. Please note that the last day for new loans will be Friday 23rd June 2017. The Library Monitors went on a Trip to Regents Park to find out how a secondary school library is run, "magpie" ideas and to learn about reading progression. During a guided tour, they had the opportunity to ask lots of questions before exploring the library independently and completing a quiz. 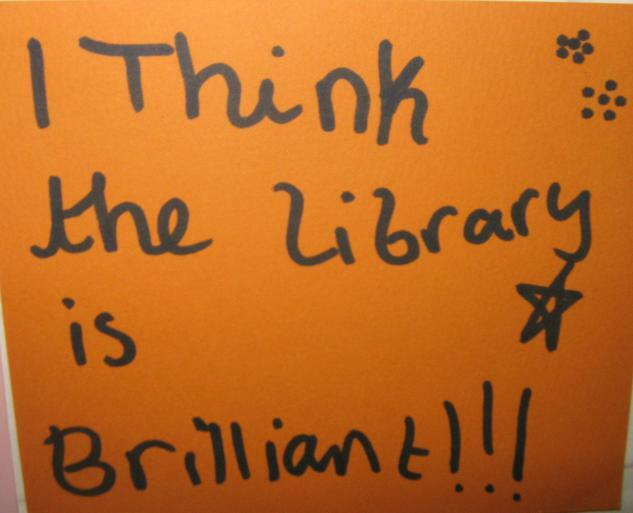 On our return to the Academy, the Library Monitors were buzzing with ideas and enthusiasm. We are looking forward to implementing some of these ideas in the very near future. Needless to say, the Library Monitors were impeccably behaved throughout and were a credit to us all. Help us try and win a staggering £5,000 to spend on books by entering the National Book Token Competition. Follow this link www.nationalbooktokens.com/schools and fill out the short form. If it's your name they pick out of the hat you'll receive £100 worth of tokens. 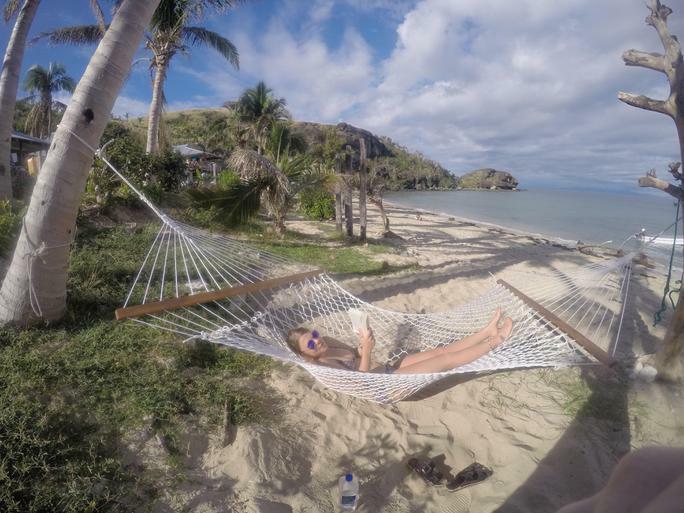 Perfect to treat yourself or others. 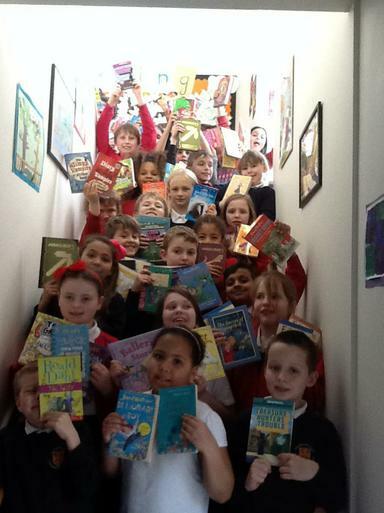 Should we be the lucky winners, we would use the prize to continue our development of our school and class libraries. The 3rd and final Library Monitor Assembly was a great success. Our hard work paid off as the critics and audience alike praised the performance. 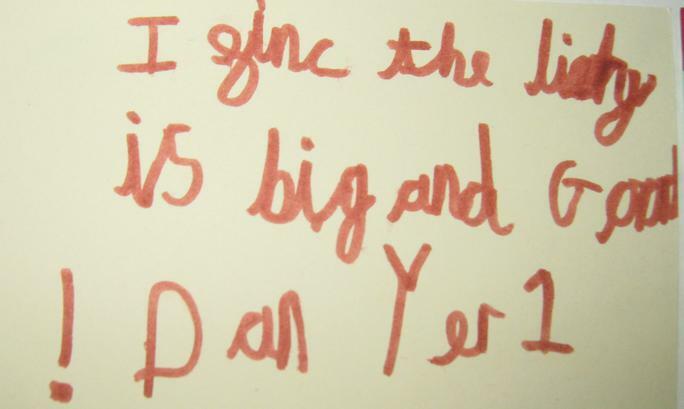 Jack W (Year 6) went as far to say "It was the best assembly ever." This was most complex of the three assemblies, and the children showed amazing dedication and determination to get it right, following direction but also allowing their natural talent to shine through. If you missed it, or want to watch it again, click on the link below, and find out that Britain (and Freemantle Academy) certainly does have talent! 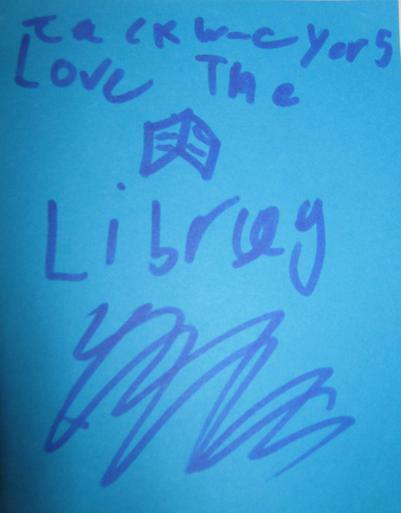 The Library held poetry workshops today. The children read and listened to poetry and learned about different types and styles before setting off and creating poems of their own. 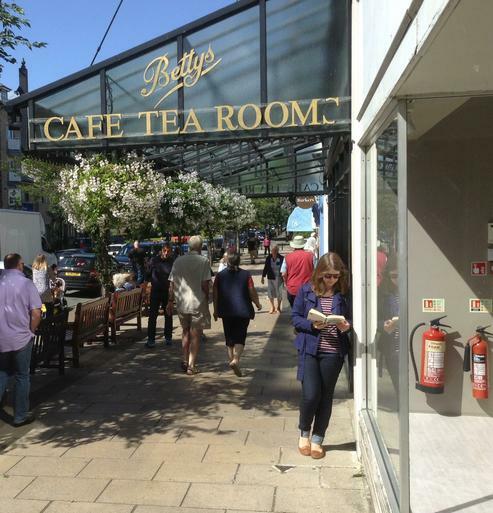 The poems are being polished and perfected and will appear here soon. We are having a wonderful celebration of books and reading today. Look out for your World Book Day Token in your child's (dren's) book bag this evening. 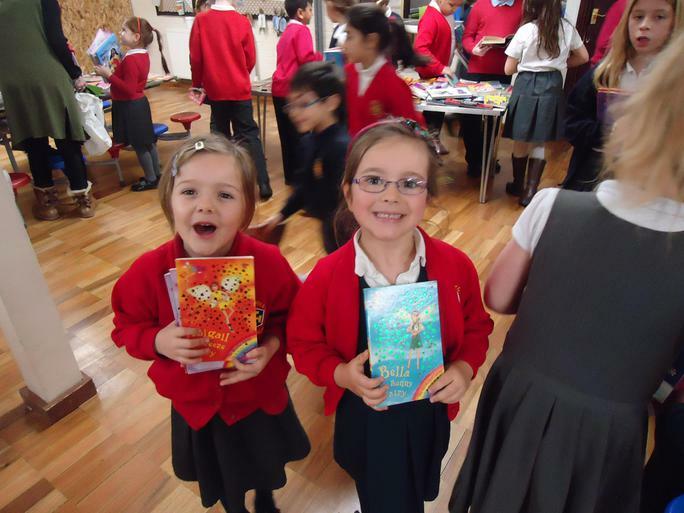 We will be celebrating our love of reading on FRIDAY 3rd March. We will be dressing up and doing book related activities all day. Photos of this fantastic day will be available soon. "What book do you love?" We celebrated National Story Telling Week (30th January - 3rd February) in style in the library. 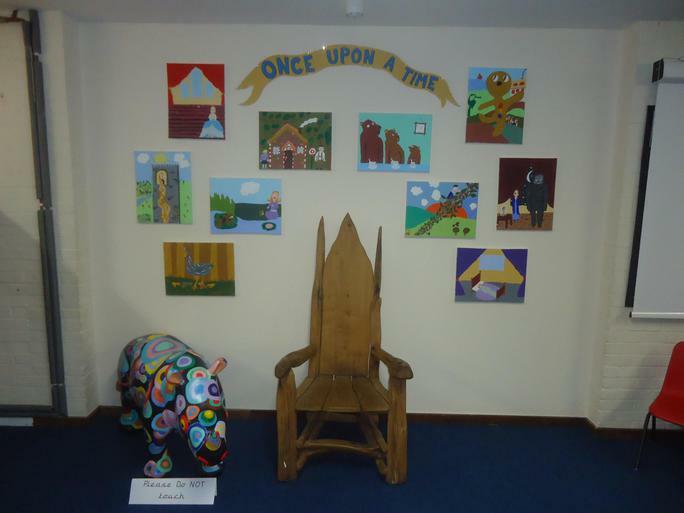 We held storytelling workshops where the children learned the history of storytelling, along with receiving hints and tips on how to tell an exciting story before being sent off to plan, practice and then perform their stories. Children were encouraged to perform their stories in whichever way they chose, using whichever methods they wanted from acting to using props . The only constraints were that the story had to make sense, had to have a beginning, middle and end, and it also had to have a problem that gets resolved. There are some photos below of the some of the children in the workshop. Our resident storyteller was also busy telling original and other stories to the children. These included "Help! My Yellow Submarine is Sinking! ", "The Very Hungry Builder", "The Tiger Who Got Stuck up a Tree", "The Very Lazy Prince", and the highlight for many of the children, an exciting retelling of a Superman story, which was so popular we had add two more shows! If you have received a letter informing of an overdue library book then please respond to this, even if you think the book has been returned. You can do this by talking to a member of your staff in your child's year group, directly to Mr Parsloe or via our email address: info@freemantleschool.co.uk. 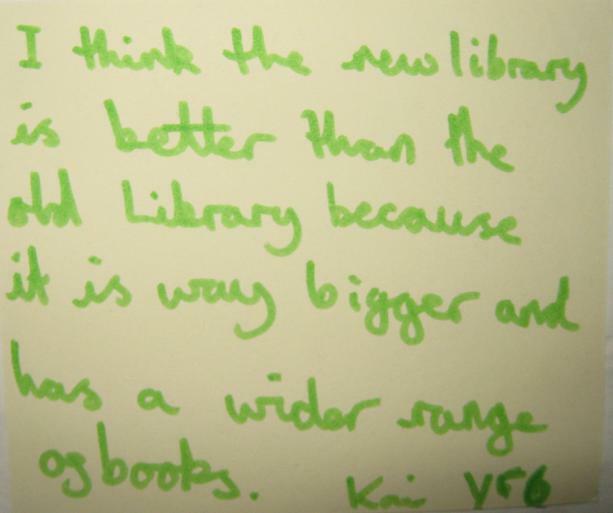 Occasionally books and letters do cross over but more often the book has either been put in the classroom by mistake or put in the library without scanning back in. The sooner we know that a book is missing the easier it is to find it. The library once again was transformed into a theatre, this time for a special version of The Elves and the Shoemaker. The children enjoyed the "sell out" show and then discussed the differences to the original story. Years 3,4,5,6 have enjoyed extracts from a variety of novels including: Mr Majeika, Romeo and Juliet, Dikin Dings and the Frightening things, The Adventures of Hercules and poems from Please Miss Bulter. 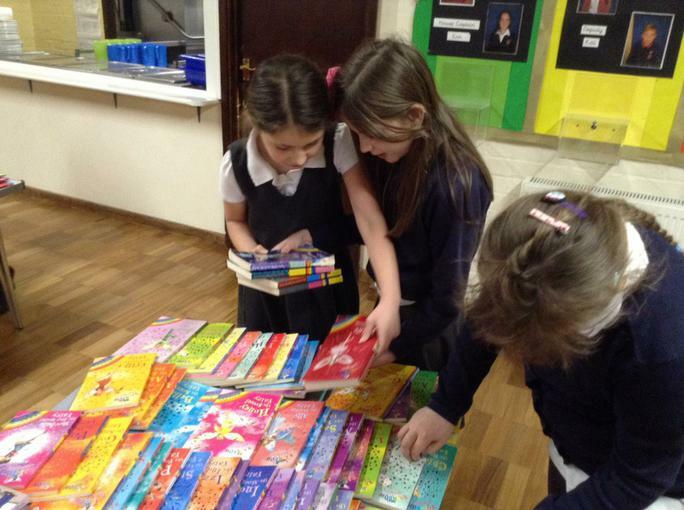 We are pleased to announce that the Book Fair has raised (yet again) a staggering amount for new books in school. 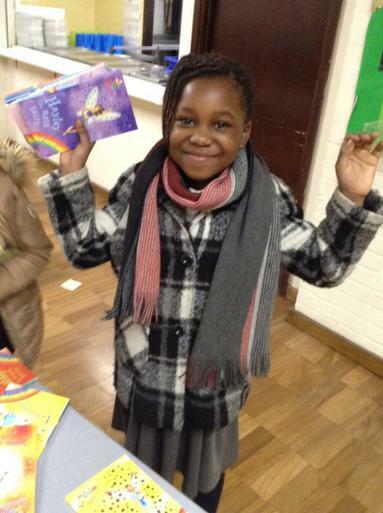 Thanks to your amazing generosity, we now have over £470 to spend on new books for the school classrooms and library. We are currently browsing the huge range of books available and will let you know of the wonderful books we buy in due course. Mr Parsloe, on behalf of all our pupils and staff at the Academy. Please support the Freemantle Book Fair from the 3rd -10th of November. 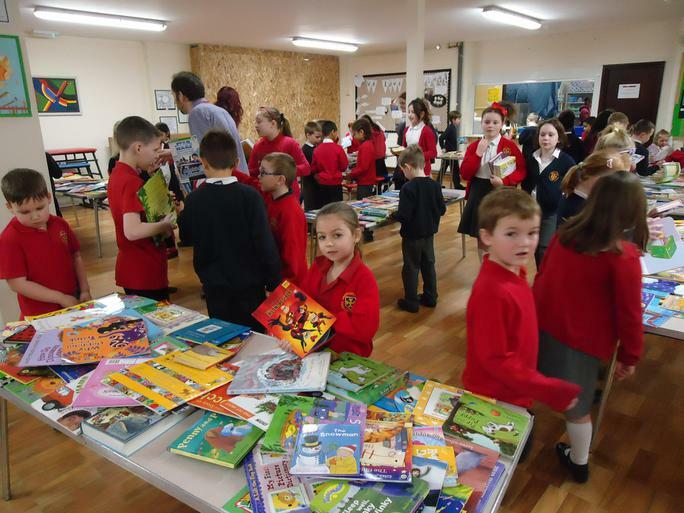 Please come along before or after school and have a browse. It's a great chance to buy Christmas presents. Discrete ordering service will be available. There will be a leaflet sent home with a small selection of the books available in due course. All the details you need will be included. 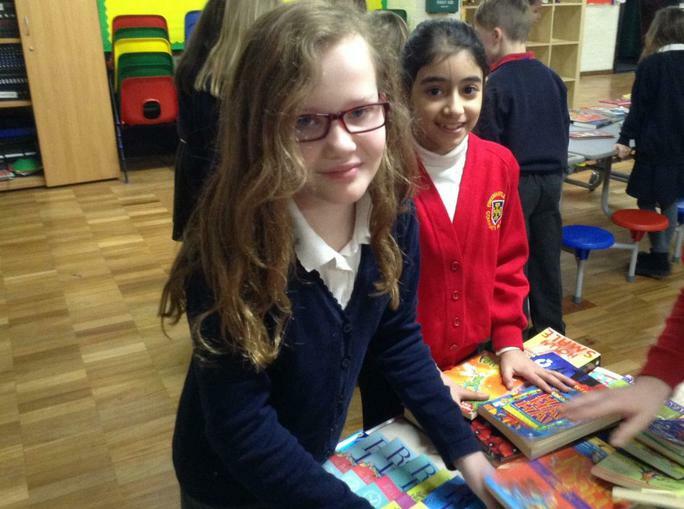 Every book you buy helps us buy new books from the school library. 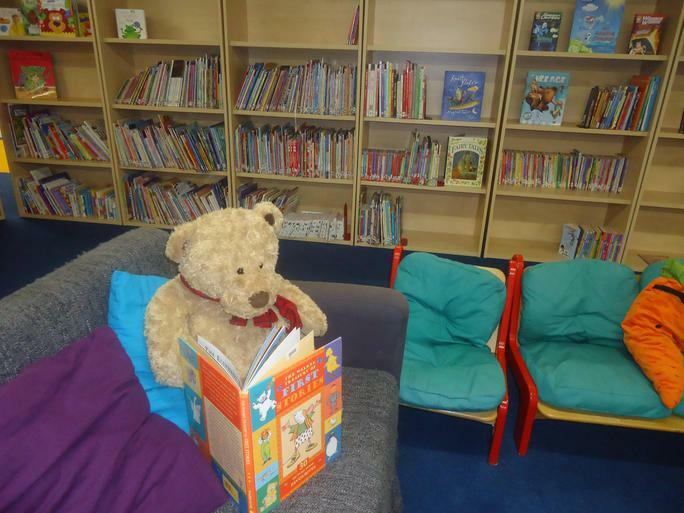 The Library was transformed into a theatre for a very special re-telling of Goldilocks and the Three Bears last Friday (7th October). The three shows attracted children from throughout the entire age range in school and there was not a spare seat in sight. Fun Friday will return soon. To check stock, see what books have been returned and to check your child's account. If you notice anything unusual on your child's account please speak to the class teacher or alternativley email info@freemantleschool.co.uk. 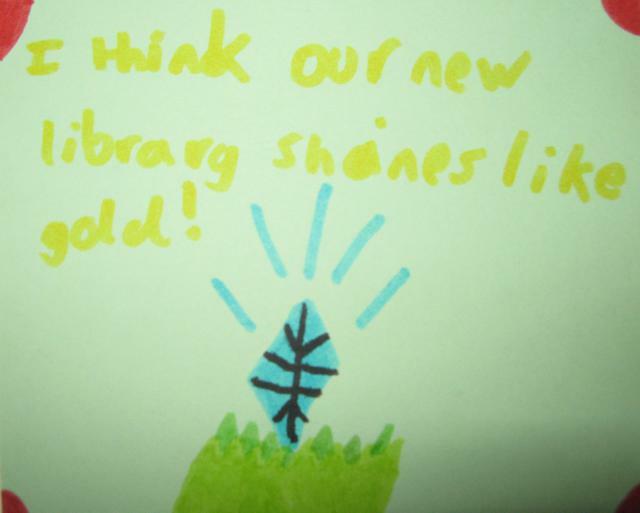 Look out for more information in your library pack coming soon! who are this year's Library Monitors. 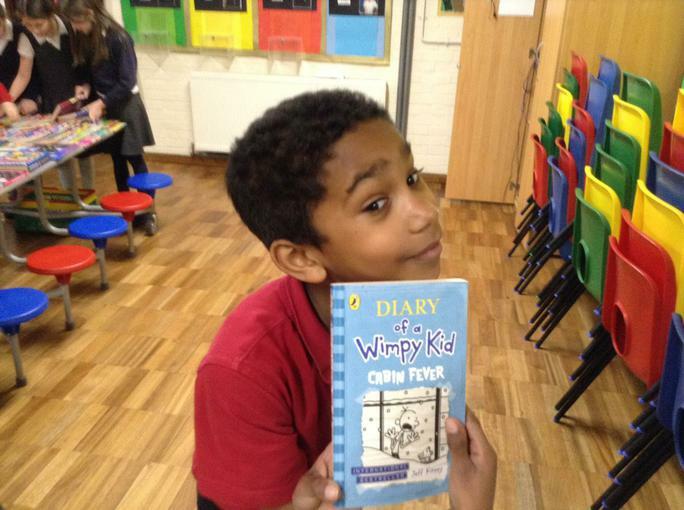 This is an important role in the school, promoting ownership, learning new skills and increasing the love of reading. The new library monitors will be introduced in their first assembly of the year, this Thursday. 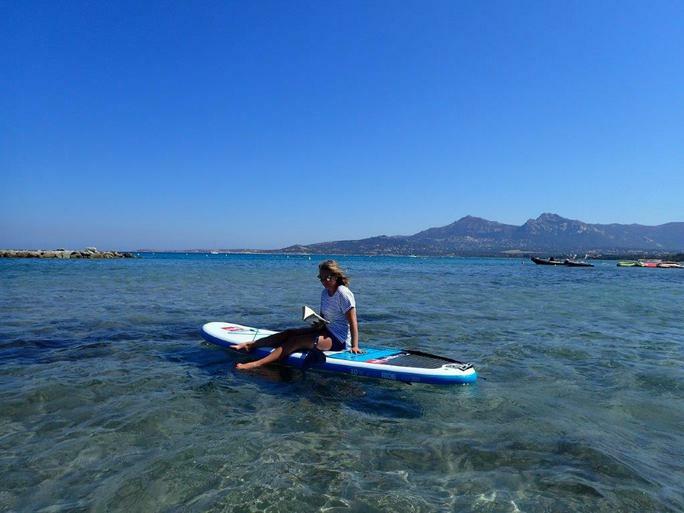 It will start and finish at the usual times (9.10 - 9.30am). 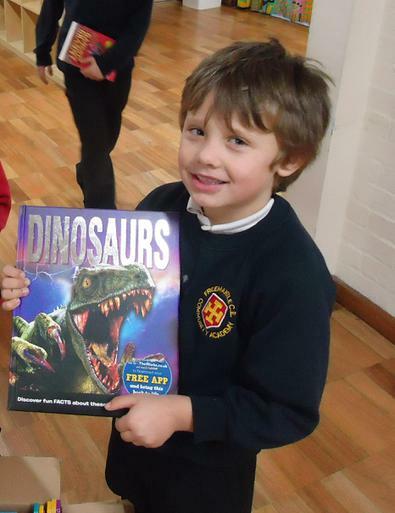 We celebrated in the Library with lots of activities. We designed our own chocolate bars, found our Roald Dahl names and placed our dreams in the dream jars. We also watched a selection of clips about his life and works in the Roald Dahl Cinema. Applications for Library Monitors are now closed. New Monitors will be announced next week. To celebrate Roald Dahl's 100th birthday we are holding special readings and activity sessions in the library at lunchtimes this week. The library is now closed for the end of year stock check and the summer break. Remember you can visit your local library which will be open all summer. All library books are now overdue and MUST be returned IMMEDIATELY. Thank you. ALL Library books need to be returned to school by Friday 1st July 2016 at the very latest. Due to an up-coming stock check the last day for new loans is FRIDAY 24th June. A FULL RECALL of all books on loan at home will start next week. Please look out for signs in school or check back here for updates. 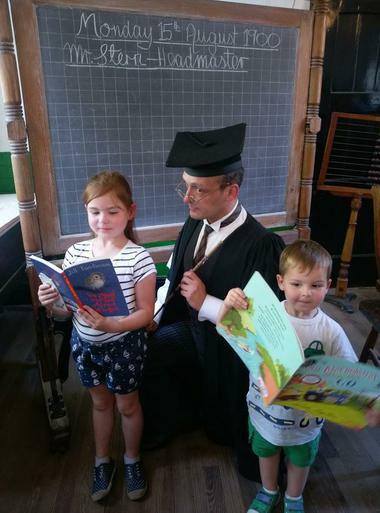 We are thrilled to announce that we raised £170 for Readathon and its charities. Many thanks to all the children who took part and to all of you who sponsored a child. 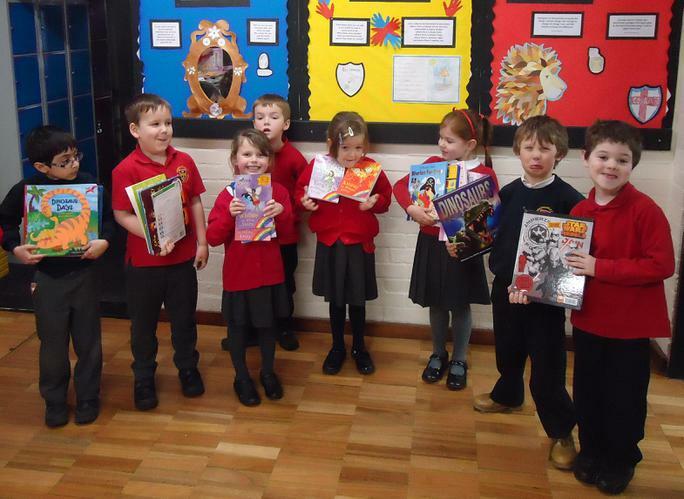 Thanks to your amazing generosity over 60 new books have been purchased for the school library. The children are extremely happy and, on their behalf, I thank you once again. 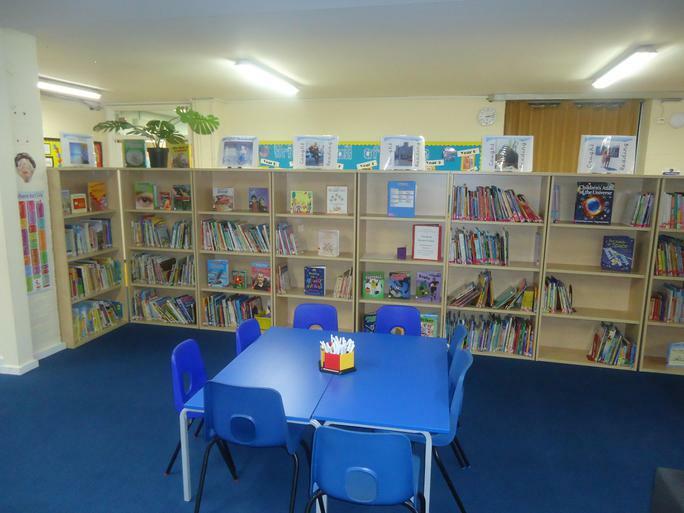 The new library is now located in the old school hall and is fully open. Photos coming soon! 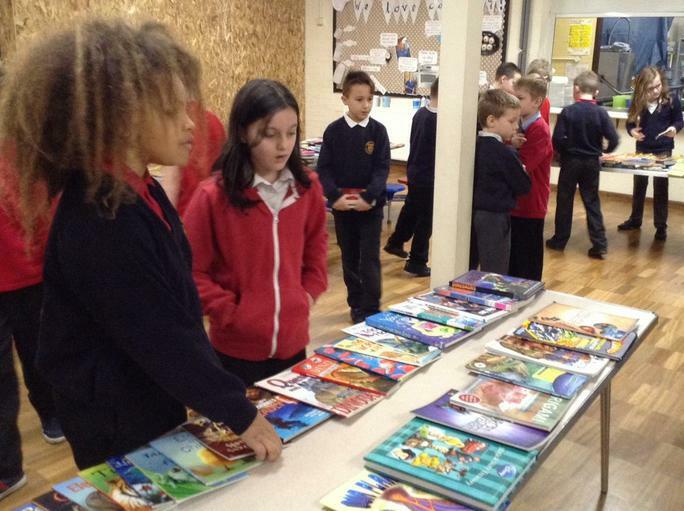 Our first ever Book Swap was a roaring success with nearly two hundred children taking part across the school. 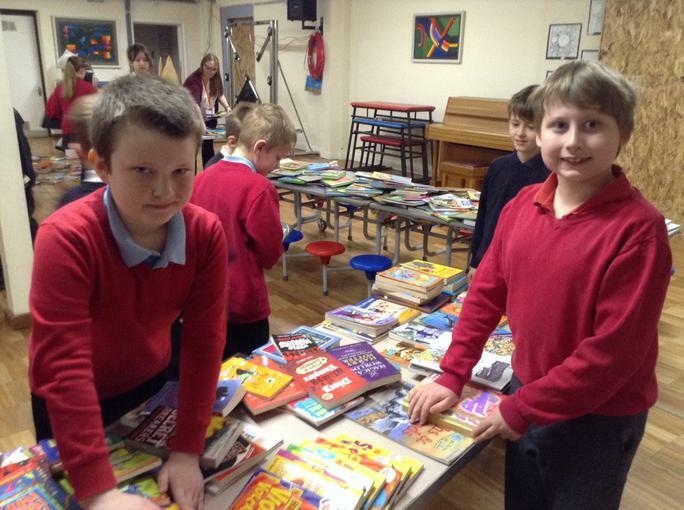 Thank you to everyone who took the time to bring in books, and to those who helped on the day. 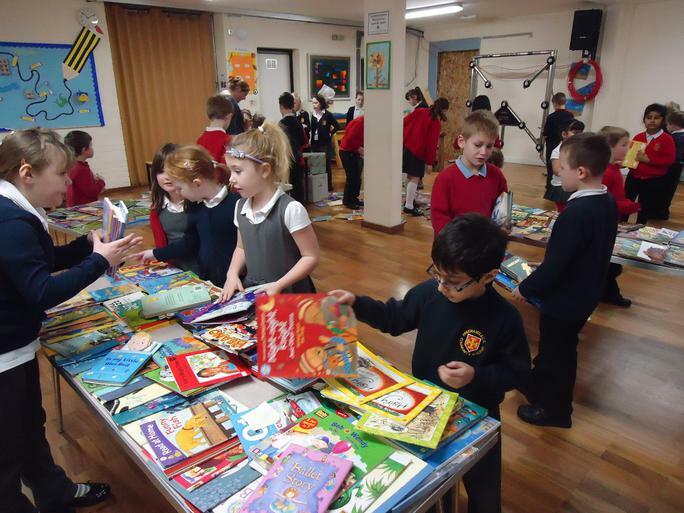 Lots of you bought in extra books so there was a fantastic selection to choose from. 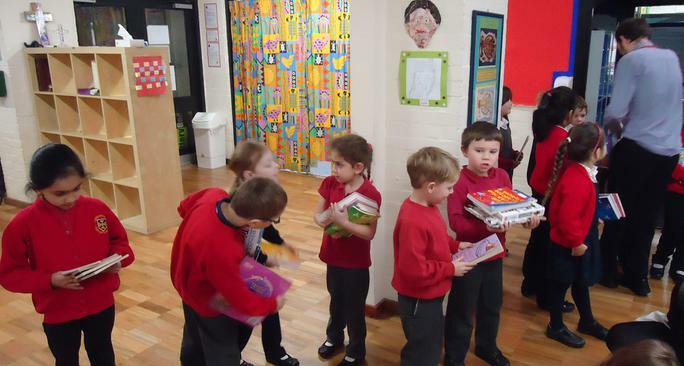 We saw some real acts of kindness with children taking books for brothers, sisters and cousins as well as giving friends books from their allowance. 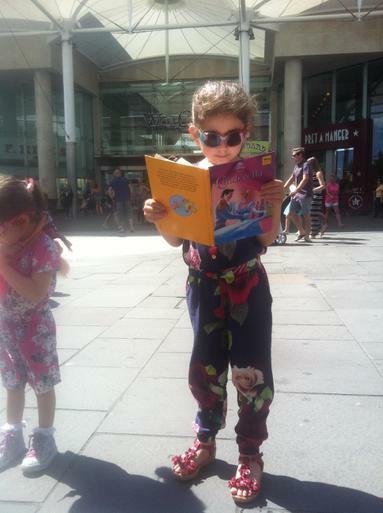 We even saw children give the books they had chosen to disappointed children. 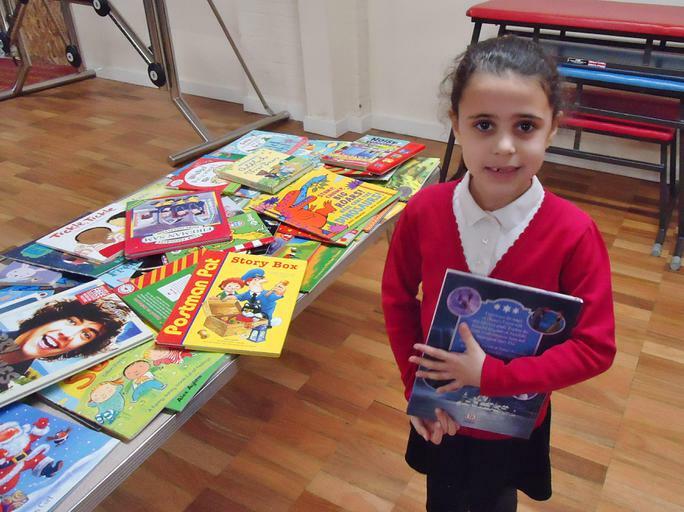 This event was a fantastic chance to promote the children’s love of books and allow children to practice their book choosing skills. The acts of kindness and friendship that were witnessed helped to make this special event even more special! What is going on outside the Library? 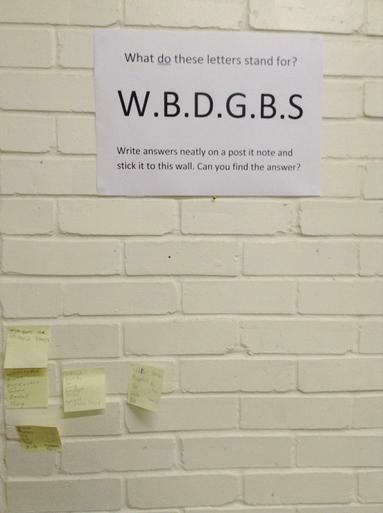 What does W B D G B S stand for? 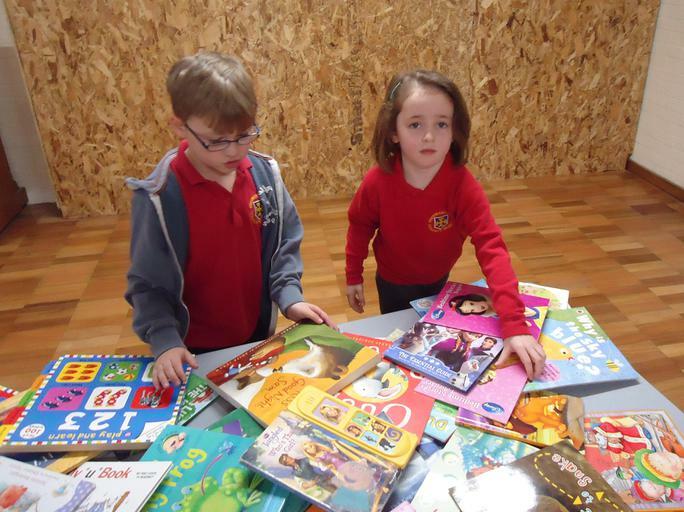 Thanks to your generosity we raised a staggering £450 to spend on books. 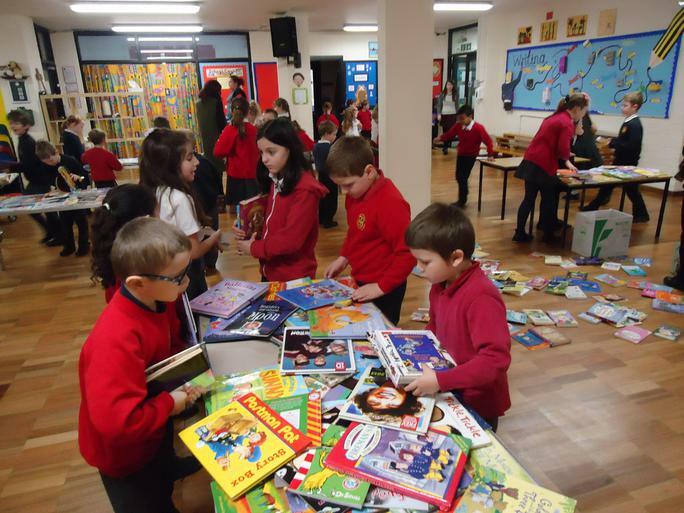 The Book Fair will return again in November 2016. 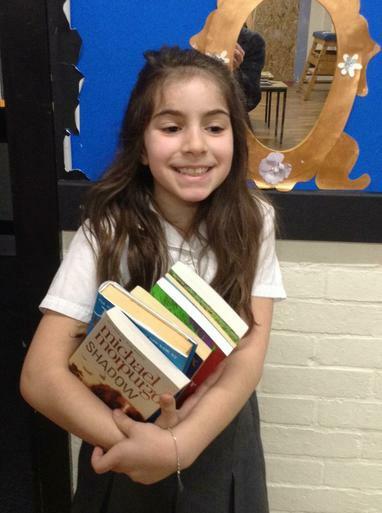 Please support the Freemantle Book Fair from the 5th -11th of November. Please come along before or after school and support us by buying a book. 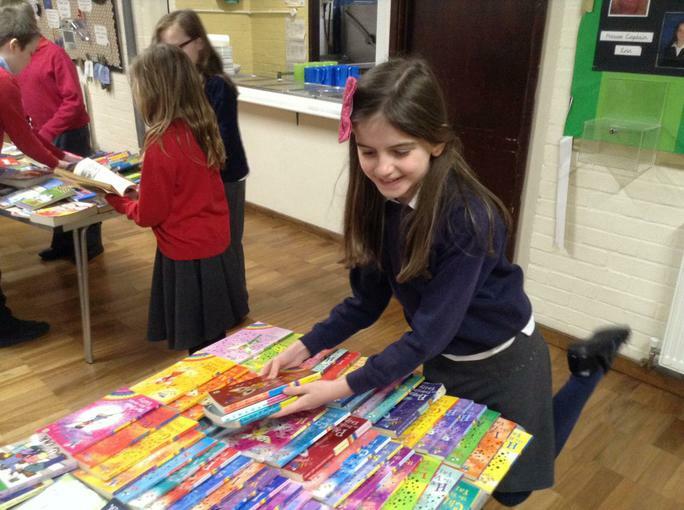 Every book you buy helps us buy new books from the school library. Last year all these books were bought for the library after the book fair! Thursday 8th of October was National Poetry Day. Follow the link below to hear a selection of poems that have been written, illustrated and performed by the poets of Freemantle Academy. Premier League Reading Stars Online Challenge. Each Premier League club has nominated a player as our "Reading Champion". Each player has set you three challenges, based on a book, website article, poem or play. Are you professional, world class or legendary? Take the challenge. Follow this link to find out more.